Grosseto | Just Visit Siena ! One cloudy day in Grosseto ! 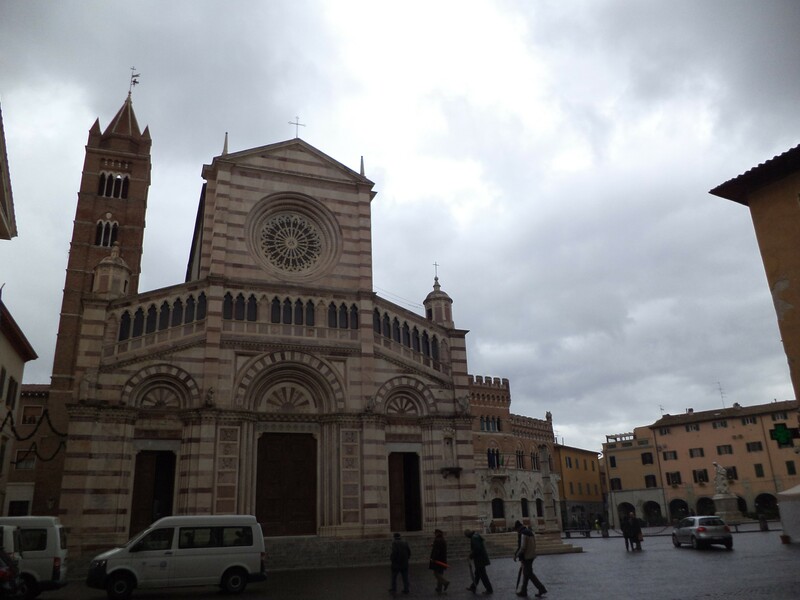 Today I want to write a bit about another city of Tuscany – Grosseto. You can easily reach it from Siena both by bus and by train. I want to present you here some photos that I took in the city center. But you can’t forget about Marina di Grosseto, very famous tourist destination located twelve kilometers from Grosseto. However the center of the city is rich in interesting sights and monuments. Certainly your attention will attract The Medicean Walls (that are now used as a public park and walking area); the Romanesque Cathedral (the main monument of the city); Church of San Francesco and Church of San Pietro (that is the oldest religious building in Grosseto). Being here you will have also the opportunity to admire a lot of interesting buildings. The most famous are for sure: Palazzo Aldobrandeschi; Palazzo Comunale (Town hall); Palace of Monte dei Paschi; Palazzo Tognetti and Teatro degli Industri. During your rest don’t only forget to taste local typical breads – Schiaccia alla pala (oven-baked bread with oil) and Schiaccia con cipolle e acciughe (oven-baked bread with onions and European anchovy). As you can see even clouds are not able to cover the beauty of this city. That is why it is impossible to miss occasion to visit it when you are in Tuscany! As I mentioned at the beginning you can go there from Siena by train (travel will take about 1h50 and single ticket costs 9,10 € http://www.trenitalia.com/trenitalia.html) as well as by bus (travel will take about 75 min. http://www.sienamobilita.it/en/orari.html). Of course always you can come by car. So now it just remains to wish you a nice sightseeing !